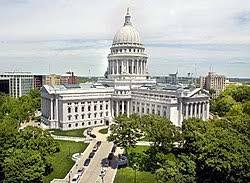 The 2017-18 Wisconsin State Legislative Session kicked off on Tuesday, January 3 with the inauguration of legislators in both the State Assembly and State Senate. All 99 members of the Assembly and 16 members of the State Senate took the oath of office. Vos also said he wants to focus on addressing transportation funding, reforming Wisconsin’s tax code, and updating the school funding formula. “I’m confident that we can continue to make big and bold reforms,” he said. Similarly, the State Senate also returns with a larger Republican majority after picking up a seat in the November election. The Senate is now split 20 GOP seats to 13 Democratic. The legislature welcomes 15 new legislators in total: 11 in the Assembly and 4 in the Senate. Many replaced retired legislators, except for Representative Treig Pronschinske (R – Mondovi) and Senator Patrick Testin (R – Stevens Point) who both unseated Democratic incumbents.